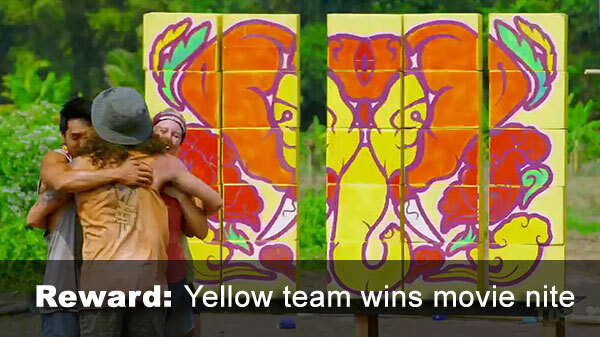 Ep.10 Reward challenge: "Challenge Pitch" - The yellow team (mostly Matt, but eventually also Dave, Tess) knock off blocks efficiently, and Lisa solves the puzzle swiftly, well ahead of Tara and the blue team. They win a trip to see "Jurassic World" with popcorn, soda, and videos from home. Adam is livid. 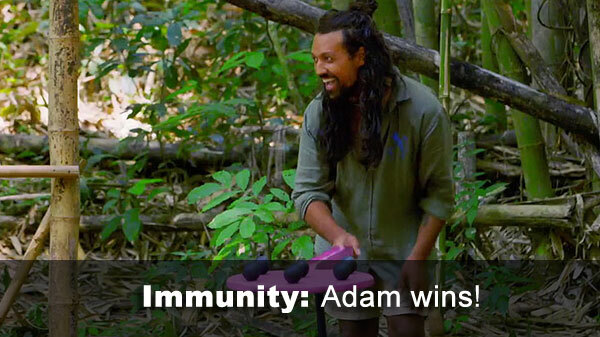 Ep.10 Immunity challenge: "Paddle Out" - Dave and Adam turn out to randomly be whizzes at this, but Dave drops on the final ball, and Adam wins. Ep.10 voted out: Renee, 5-3 over Dave. Dave again does not play his idol. - IC scoring: This was one of those challenges where it's impossible to accurately know where everyone finished, and we're entirely dependent on the editing to score it. To that end: Lisa, Renee, Tara, and Tess were never shown placing a ball. We'll assume they ended with zero. Matt was shown placing one, and in a later group shot, still had it (good enough for 4th place). Eve was shown with three. Clearly, Adam won with six balls placed. Finally, after dropping all five of his originally placed balls (while Adam also had five placed), Dave somehow managed to place two more balls again before Adam finished. (When Dave drops his paddle at the end, he has two balls placed, at least.) So we're giving Dave credit for third place, between Eve and Matt. 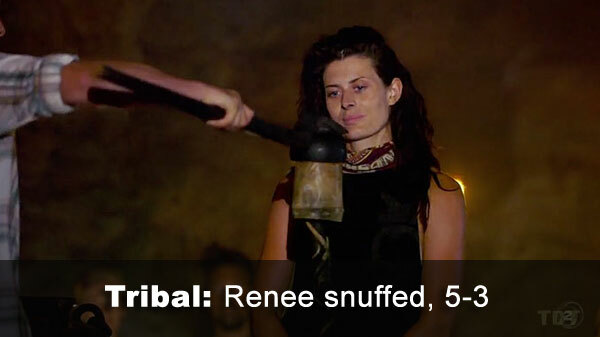 - Renee received 5 votes, from Dave, Eve, Lisa, Matt, and Tara (voted out, 5-3).